The drive from Augusta, Georgia to the Florida panhandle takes over 7 hours. I chose a route of mostly back country highways that bisect farmland, abandoned farmland, and second growth forest. I saw almost as many species of birds while traveling on these back roads as I did when I visited Wakulla Springs State Park the following day, but spotting birds while driving 60 mph is not as enjoyable as spying them on a leisurely boat ride. We stayed at the Best Western Hotel in Medart–a beautiful, clean, and spacious base of operations for my natural history explorations. 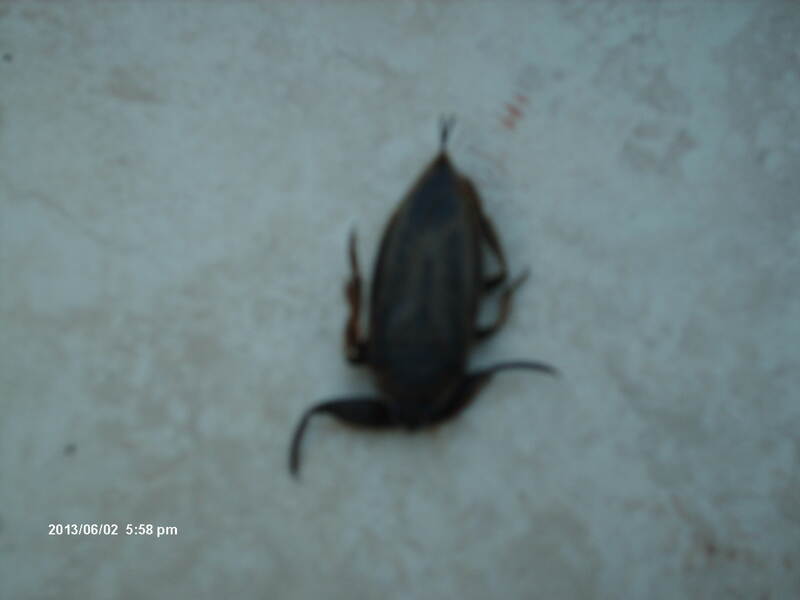 I went for a swim after the exhausting hot drive and was excited to find a dead giant waterbug in the swimming pool. Giant waterbug. (Lethocerus ? sp.). They prey on tadpoles and minnows by grasping them with their front legs and sucking the life out of them. They’re considered a delicacy in Asia. Courtyard of the Best Western Hotel in Medart. 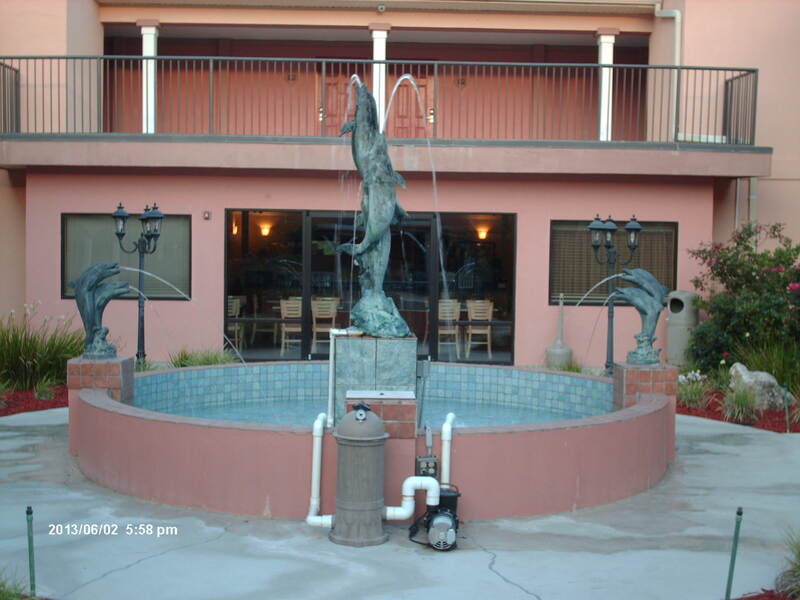 It’s newer and nicer than the Wakulla Springs Lodge. 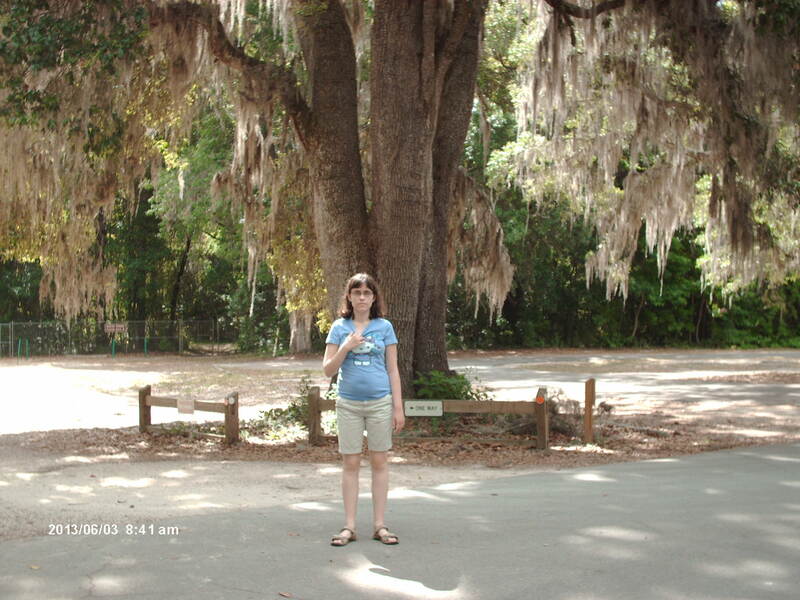 We went to Wakulla Springs State Park the next day, and the rich variety of wildlife quickly eliminated any doubt over my choice of vacation. Even my wife and daughter were impressed, and they don’t share my love of nature. The cost of admission is $6–a pittance compared to the value. We saw 4 manatees and big schools of mullet right away before we even went on the boat ride. 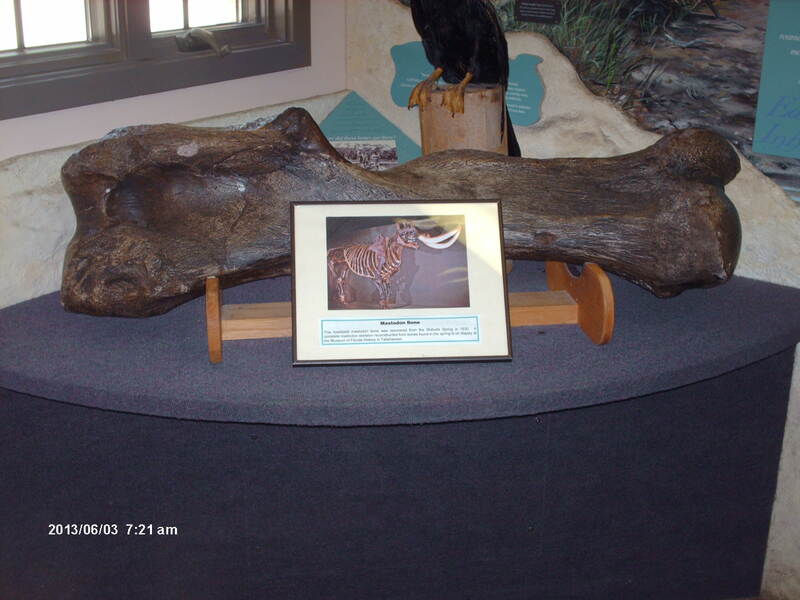 Mastodon leg bone excavated from Wakulla Springs. Most of the Pleistocene mammal fossils were collected between 1859-1930. I doubt there are any left to find. 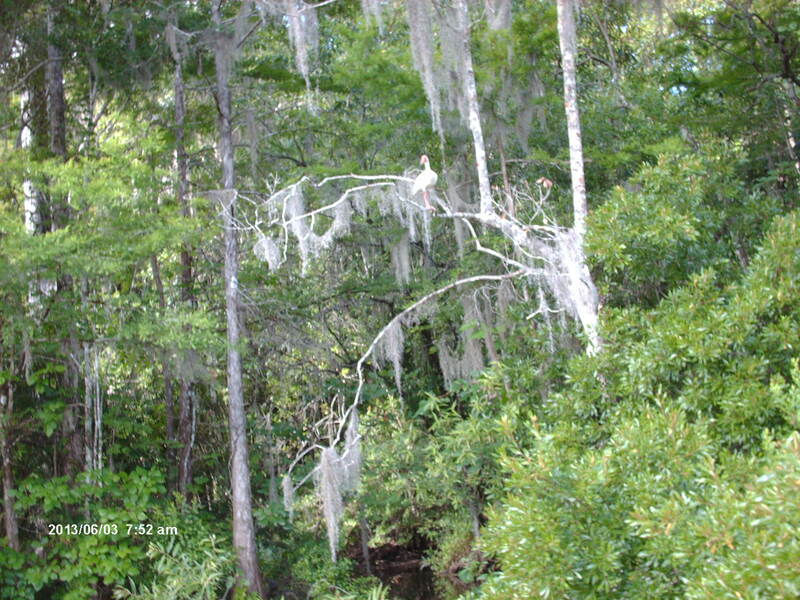 During the Ice Ages many rivers in Florida dried up and the river beds consisted of isolated springs instead. 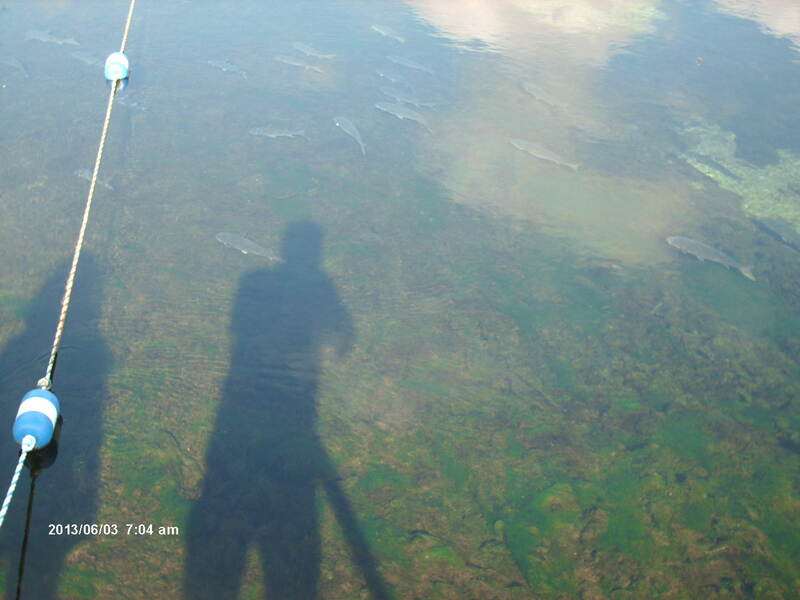 Here’s a big school of mullet in the crystal clear waters of the spring. I tried to take a photo of the manatees, but they weren’t at a good angle and they don’t show up clearly in the picture I took. One of the flat-bottomed boats was handicapped accessible, so my wife was able to go with us. Rides cost $8 per adult. The captain serves as a guide and identifies all the plants and animals on the 45 minute journey. A flat bottomed boat is necessary because the water is shallow, except where it bubbles up from a deep underground cavern. 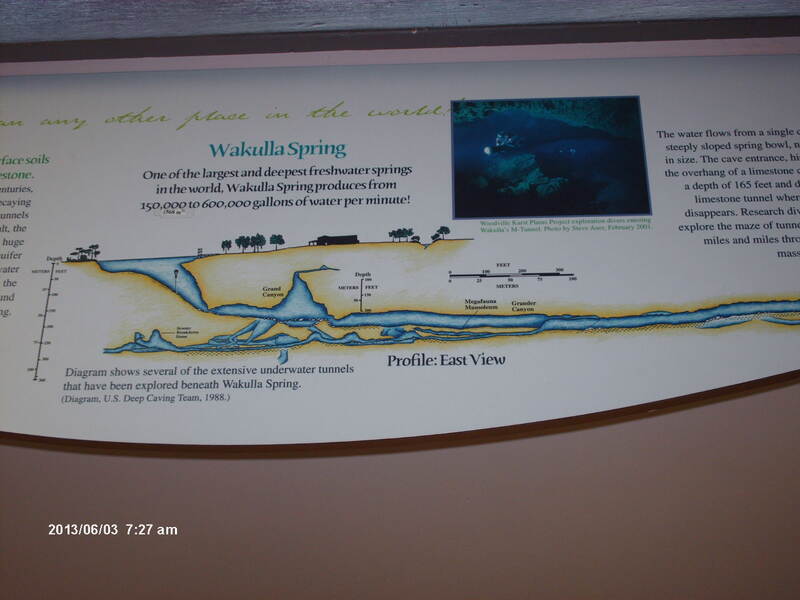 Map of the springs underground. Several roads are as much as 200 feet above the underground part of the springs. Signs on the local roads let drivers know this fact. I guess that’s so drivers won’t be surprised if the road collapses. The bird life is spectacular. I saw a cattle egret rookery, common egrets, a great blue heron, little blue herons, a green heron, a yellow crowned night heron, a white ibis, wood ducks, pied billed grebes, anhingas, ospreys, coots, prothonotory warblers, red-winged blackbirds, crows, mockingbirds, and blue jays. I also heard a woodpecker. This was the first time I’d ever seen 3 of these species–the yellow crowned night heron, the white ibis, and the prothonotory warblers. I have seen ospreys before, but this was the first time I ever saw an osprey nest, though I saw one again the following day at Otter Lake. The guide said just about every tree snag was home to a wood duck nest. Cattle egret rookery. I really need to get a telephoto lens. Cattle egrets are common all across the rural countryside now where they hunt for insects stirred up by livestock and farm machinery. White ibis. This was the first time I’d ever seen this species. If you enlarge the photo, you can see the wood duck in the middle of the picture. Wood ducks are abundant here. 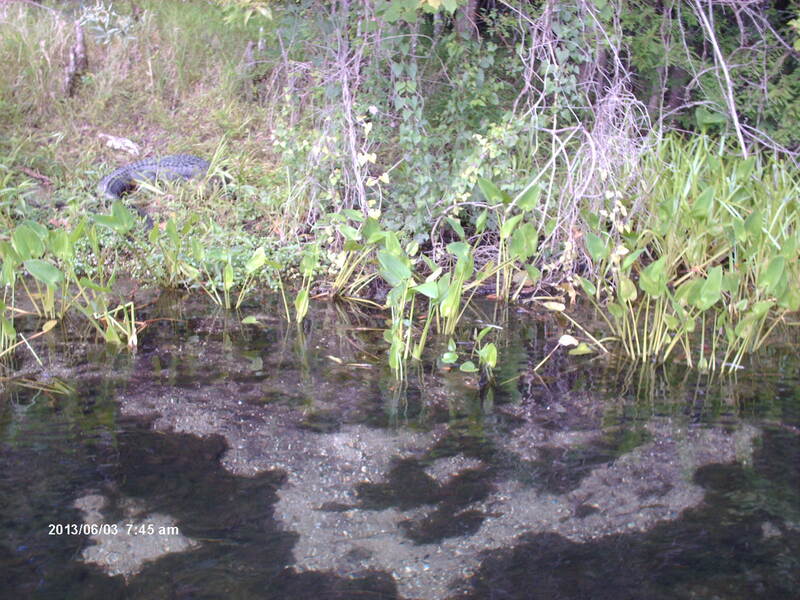 Alligators and large turtles known as Suwannee cooters were common. We also saw a soft shelled turtle. Alligator in the upper left hand corner. The Suwannee cooters were too far away for me to get a photo. The water was so clear I could see the bottom everywhere, even in the deepest part of the spring, despite the guide’s claim that the water wasn’t clear enough that day to see the bottom in the deepest part which is 90 feet. Looking into the spring was like looking into an aquarium. We could see all the fish. Mullet swam in big schools and was by far the most abundant fish, but I saw several long-nosed gar, 3 black and white sunfish, a warmouth sunfish, and someone else saw a bowfin. Little red crayfish crawled on the sandy bottom. 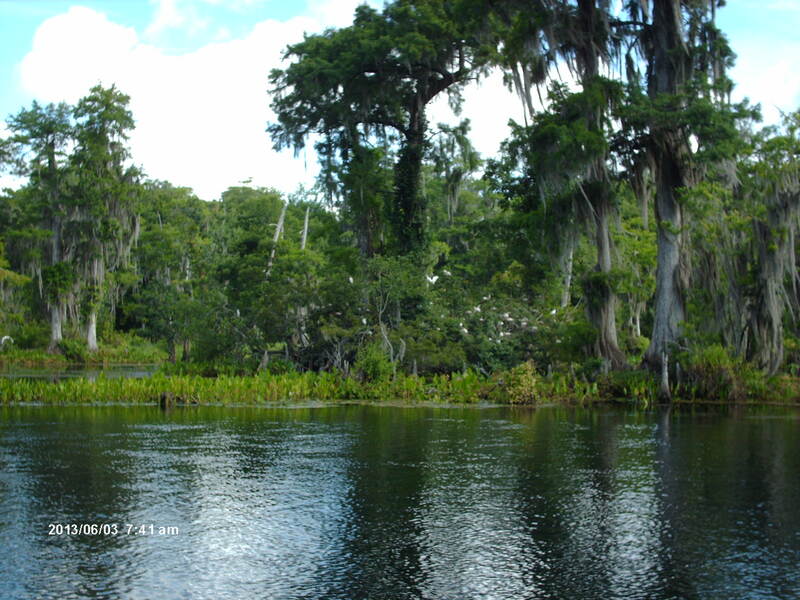 It’s easy to understand why native Americans inhabited the area around Wakulla Springs for 15,000 years. Spear-fishing was a cinch. They had such a great variety of easily obtainable animal and plant foods that they could remain well fed without agriculture. Fish, duck, turtle, squirrel, manatee, and deer were available protein year round. Duck potato (Sagitteria sp. ), cattails, wild rice, nuts, and acorns provided the starches. 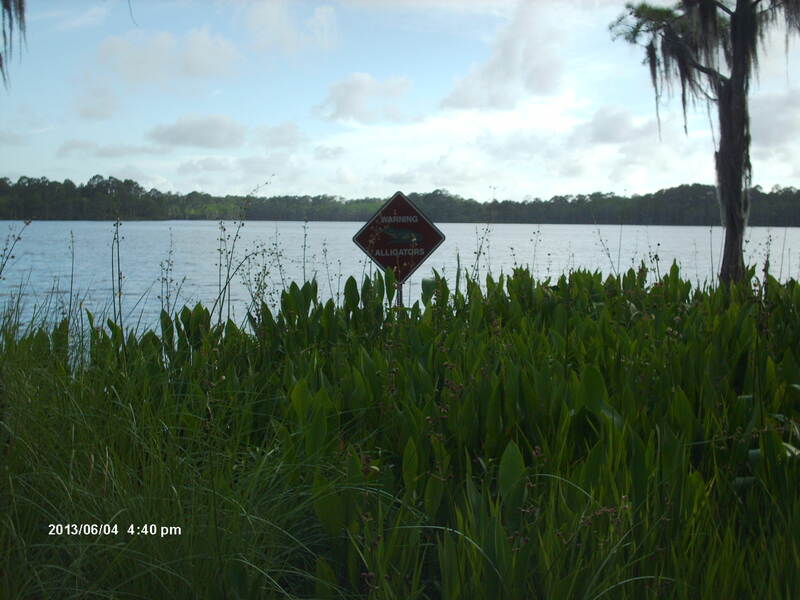 Originally, Wakulla Spring had a mostly sandy and limestone bottom, but invasive hydrilla now covers much of it and gives the water a greenish tint. The water wells up from deep underground, and the chill surprised me when I went for a swim after the boat ride. I saw cold blooded reptiles swimming in the water and mistakenly assumed the water would be warm, like a bathtub. Instead, the water temperature was at least 20 degrees F cooler than the air temperature. What a shock. 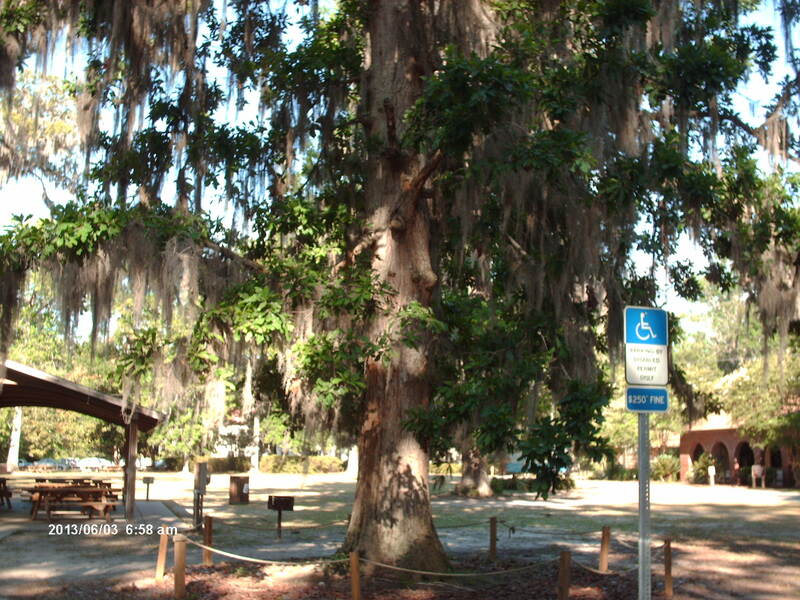 The woods around Wakulla Springs consist of white oak, live oak, hickory, sweetgum, cypress, red maple, ash, loblolly pine, pond pine, willow, dogwood, and wax myrtle. 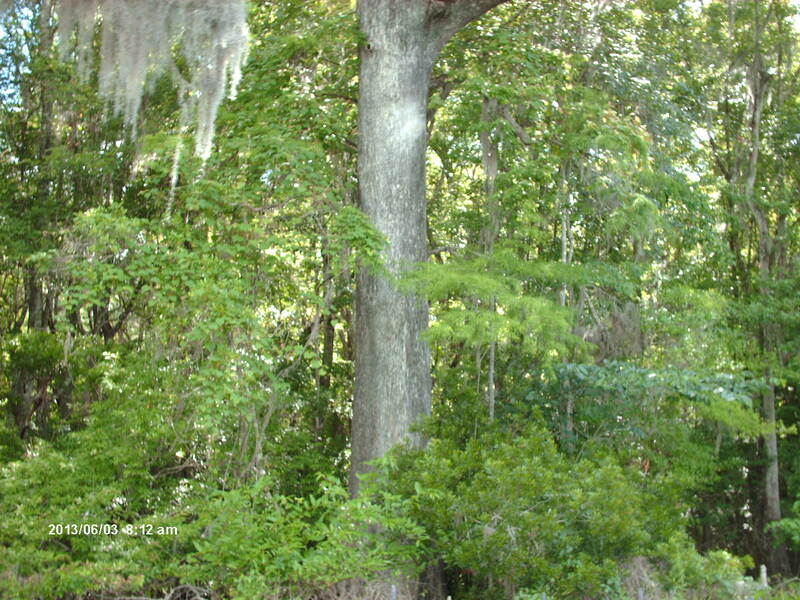 The trees are large and much of the tract looks like it holds virgin timber. The productive hickory supports an abundant population of gray squirrels. Picnickers left their lunches unattended while they went swimming. Crows and squirrels were in the process of looting their food. I saw a crow fly off with half a sandwich. Spanish moss covers this white oak in the parking lot. It had unusual leaves for a white oak. Hickory trees are abundant here. This 3-pronged one is quite large. This cypress tree is 5 feet in diameter. Scientists cored it and found it to be 200 years old. A cypress tree next to it is less than 1/2 this tree’s size in diameter, yet scientists found it was 600 (yes 600) years old. It had s stunted growth due to nutrient deficiency. 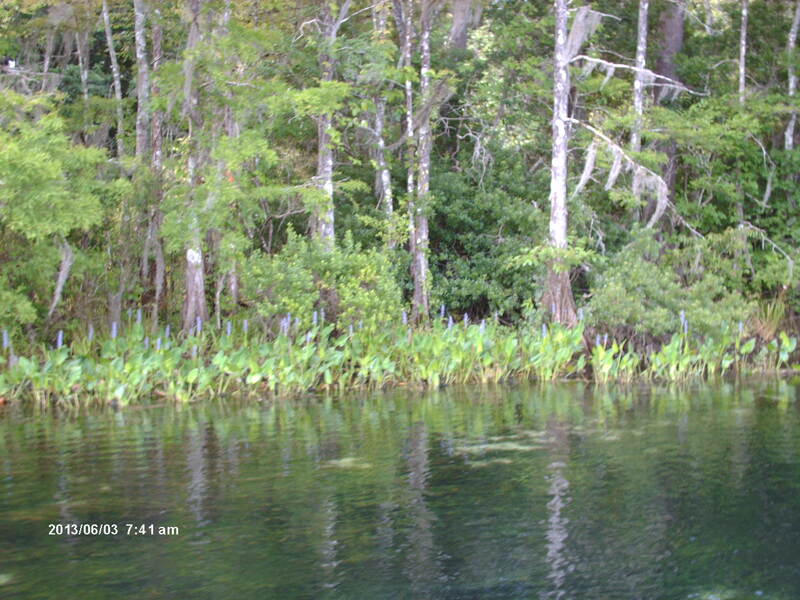 Pickerel weed (the purple) and duck potato (Sagitteria) blooming. Cypress wood is rot resistant. The guide noted a leaning dead cypress snag in the middle of the channel that looked like it was about to fall over. He said it looked that way when he first started working in the park…in 1957. Pickerel weed and duck potato were blooming. I saw 2 kinds of grape vines growing in the woods including muscadine and some type of bunch grape that had a lot of young grapes on it. As we left the park, we saw a white tail deer feeding in the middle of the day. We arrived at Shellpoint Beach about midmorning and had the whole beach to ourselves before other sunbathers joined us 30 minutes later. I didn’t find any interesting sea shells. Oyster shells were the only common ones here. 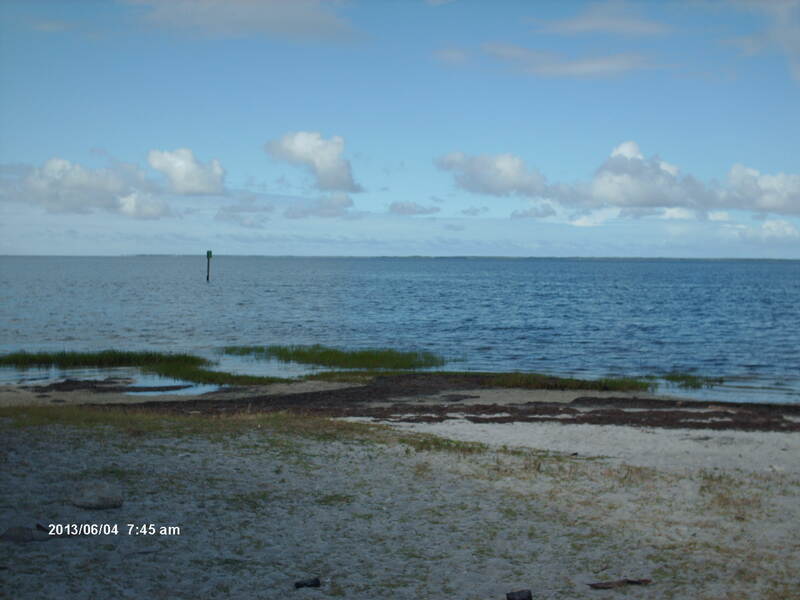 Shellpoint Beach juts into Apalachee Bay and is known more for fishing than swimming. There are seasons for grouper, red snapper, sea trout, cobia, and scallop harvesting. There are no waves over 8 inches and those are caused by boats. Laughing gulls and boat-tailed grackles hang around the pavilion, hoping to share scraps with picnickers. 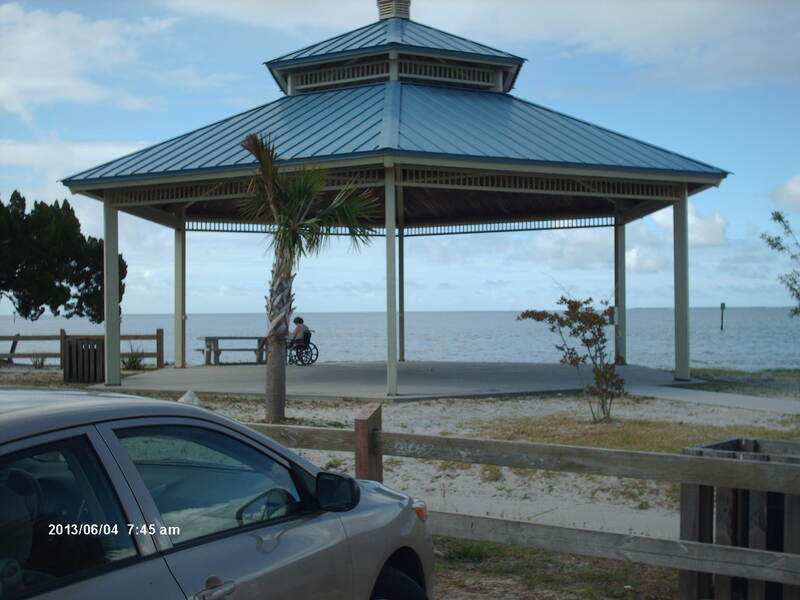 Nice pavilion at Shellpoint Beach, Florida. This refuge sprawls all along the coast of Apalachee Bay. I visited the northern half during the heat of midday which is the worst time for viewing wildlife. Nevertheless, I saw a turkey as soon as I pulled into the refuge. 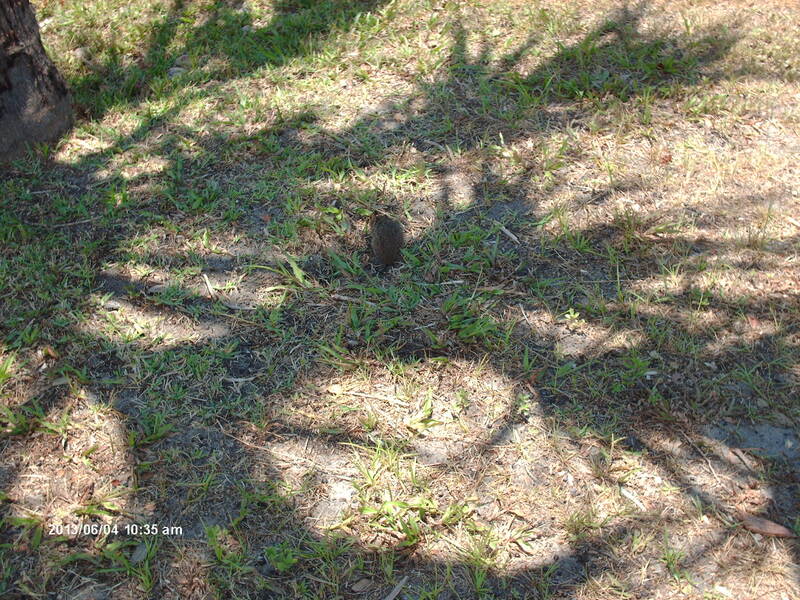 Near the lighthouse, several naive juvenile cotton rats foraged at the base of the palm. They didn’t know they were supposed to be afraid of us. 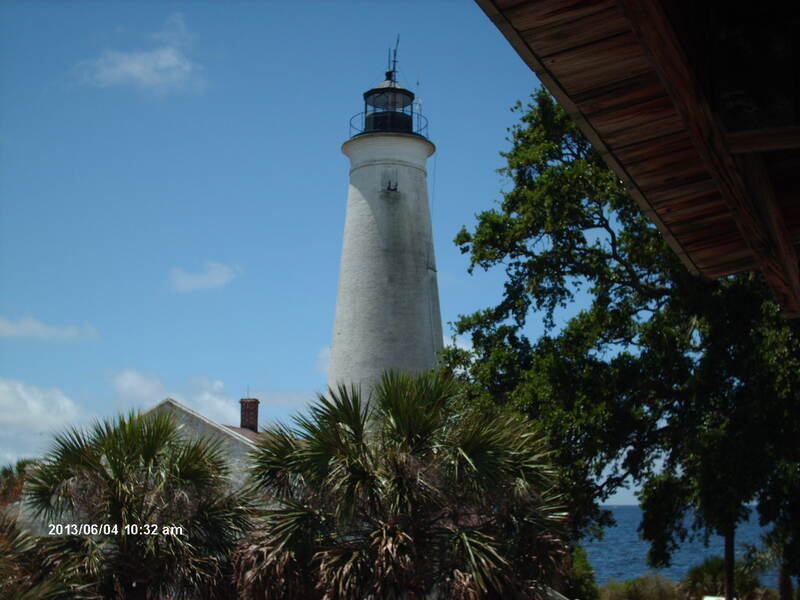 St. Mark’s Lighthouse. It’s 180 years old. It’s not open to the public. I assume park officials are worried about liability issues. Too many suicides. Young cotton rat (Sigmodon hispidus). It didn’t know it was supposed to be afraid of us. Herons eat these mammals. I’ve seen these quite often in roadside dtiches but never close up. I didn’t realize they are a cute animal, especially compared to invasive Norway rats. 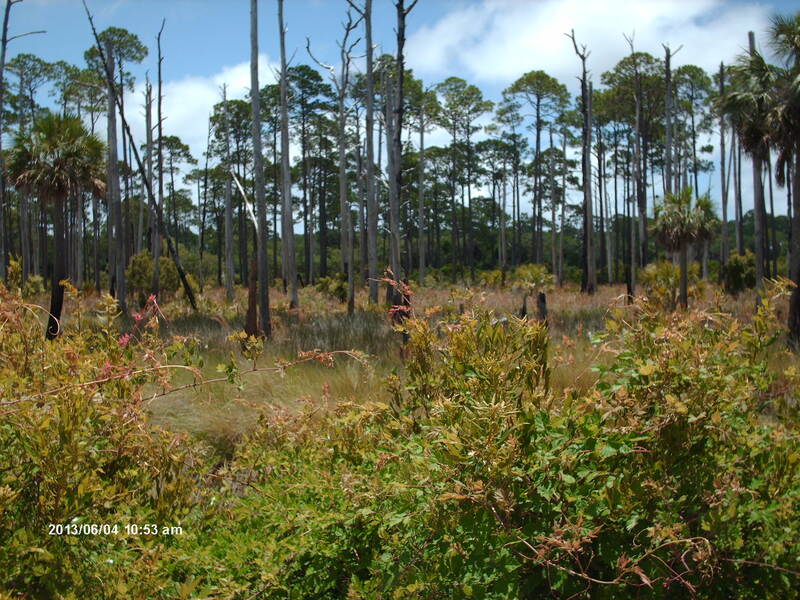 A saltwater storm surge killed these loblolly pines in 2008, creating an open habitat. 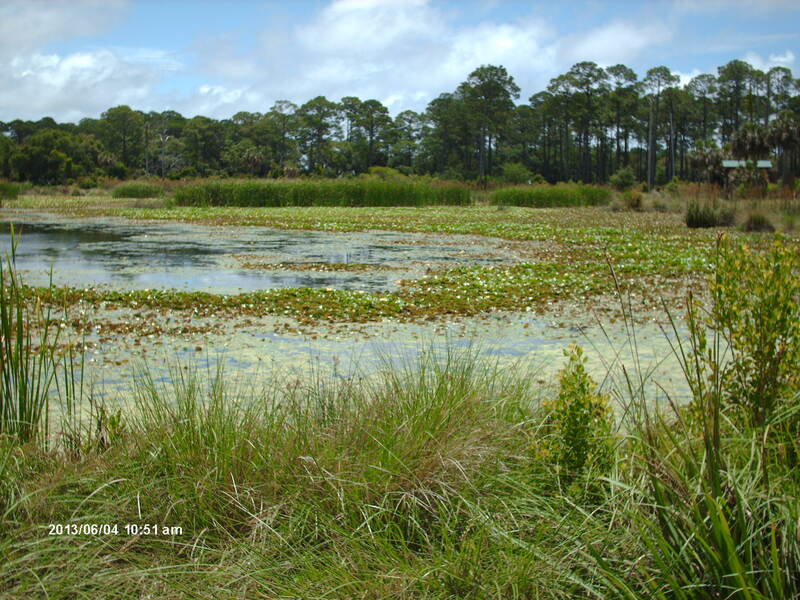 A freshwater lilly pond within the wildlife refuge. 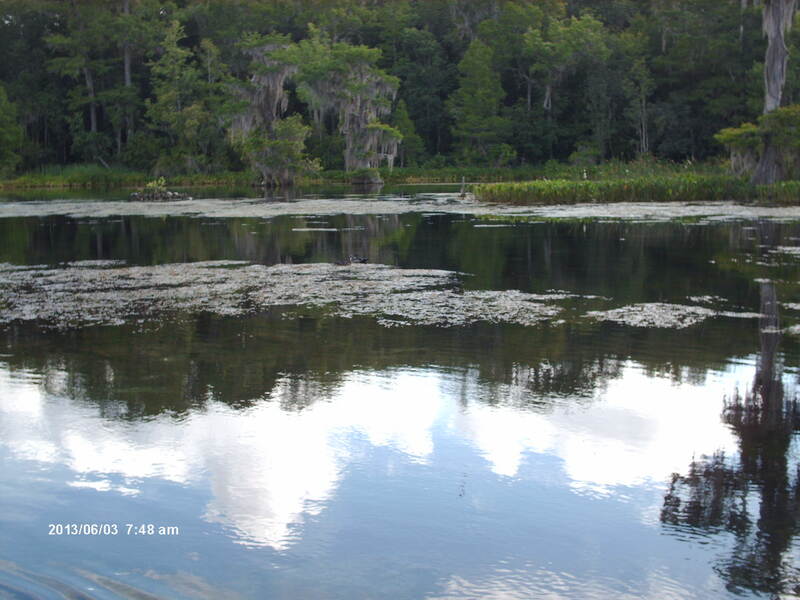 Home to alligators, largemouth bass, shellcracker bream, bullhead and channel catfish, and warmouth. Later that evening, I went to the southern part of the St. Marks NWR to look for fox squirrels. An article in The Eagle Eye, a pamphlet published by the refuge biologists, reported the presence of fox squirrels in a pine flatwoods near Otter Lake. I didn’t see any fox squirrels, but I spotted a pair of endangered cockaded woodpeckers. I saw 2 red cockaded woodpeckers in this vicinity. I didn’t even bother trying to photograph them without a telephoto lens. Refuge officials maintain this environment with fire which is evident from the abundance of burned wood on the ground. Frequent signs say “We prevent wildfire with prescribed fire.” Actually, prescribed fire is no more beneficial than wildfire. 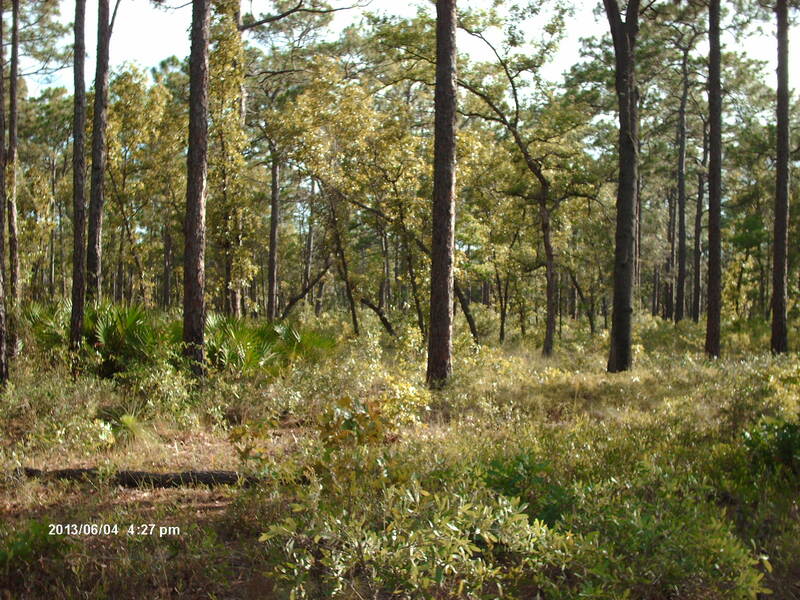 This pine flatwoods hosts loblolly pine, live oak, southern red oak, runner oak, saw palmetto, grasses, and ferns. The mosquitoes weren’t bad this time of year in Florida but a species of yellow-green horsefly or deerfly was bothersome. They thought I tasted good. There’s no swimming at Otter Lake. The sign warns of alligators. I heard sheep frogs here. There’s an osprey nest in this snag. 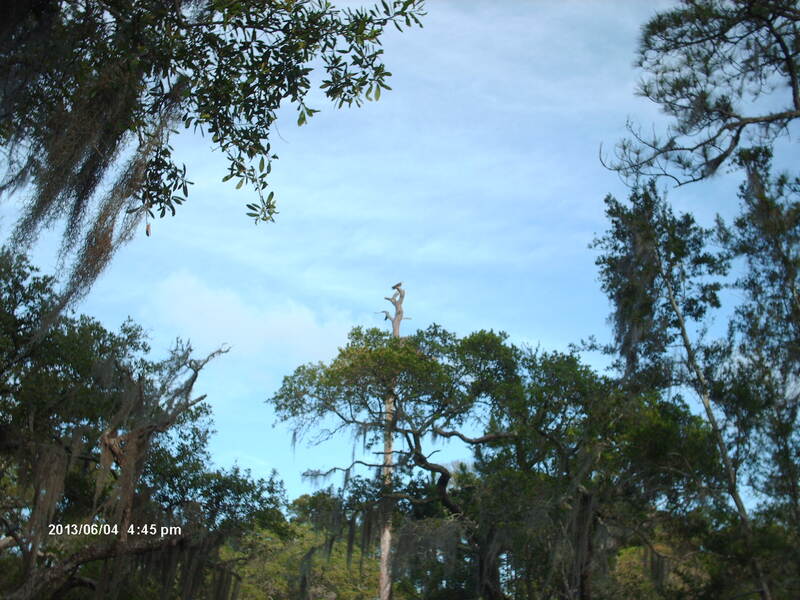 Note the osprey at the top of the tree. To top off my trip, while I was driving home through Emanuel County, Georgia, I saw some endangered wood storks foraging in a flooded ditch in a farmer’s field. I was satisfied with seeing a white ibis and wood storks until I arrived home and read a vintage ornithology book written in the early 20th century. That author saw 25,000 white ibis on a wet prairie in Florida and 5,000 wood storks at a rookery also in Florida. The Florida of 1910 is gone forever. 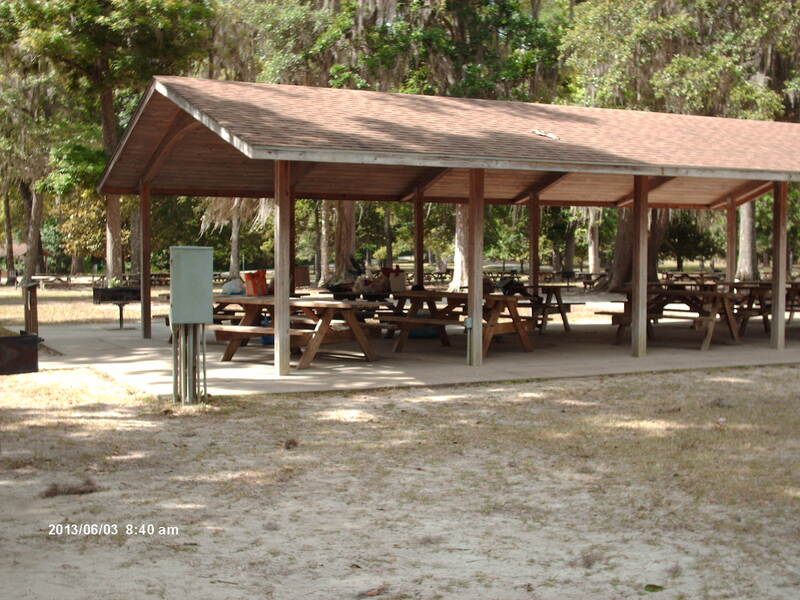 We dined at 3 restaurants in Wakulla County during our stay. I thought Barwick’s Seafood and Deli was the best, I ate grilled mullet and it was excellent, though I suspect it was broiled or sauteed rather than grilled. All the local family restaurants have $12 entrees and $9 sandwiches. Popular items found at most of them include fried seafood of all kinds (mullet, shrimp, flounder, catfish), grilled grouper sandwiches, and pulled pork barbeque smothered in an overly sweet sauce. An interesting breakfast item on the menu at the Coastal Restaurant is mullet and eggs. Mullet is really abundant in Florida. Many of the locals order farm raised catfish instead. Catfish is bland compared to mullet. One stand offers smoked mullet dip. Most of these restaurants could shave a few dollars off their prices, if they didn’t serve ridiculous oversize portions. No wonder Americans are so fat. I had 5 slices of mullet on my plate, plus a big pile of french fries and hushpuppies and a salad bar. Do Americans really expect dinners this large? I’m a member of the clean plate club and managed to finish my portion, but I exercise hard everyday. The worst restaurant was Hamahocker’s Barbeque. I ate their smoked brisket. I’m pretty sure smoked brisket is supposed to be more tender than shoe leather. The potato salad tasted like someone dumped a load of sugar on it. I like my own cooking better than any restaurant, but I can’t cook when I’m staying in a hotel.